This is the first book in the SIENNA, THE COWGIRL FAIRY chapter book series. Set in Grayson County, Texas this story is about Sienna who is not your normal cowgirl, for she’s half-human and half-fairy. But Sienna wants nothing to do with fairies. When her ma sends her to fairy camp instead of cowgirl camp, she ain’t none too happy. Not only must she deal with cliquish fairies who reject her spunky spirit and outspoken ways, she must also noodle out how to help Mother Nature end the Texas drought. Can Sienna balance cowgirling with some tried ’n’ true fairy skills to both fit in and make it rain? A fun book for anyone who has interest in cowgirls, fairies, magic, horses, weather, or Texas. In addition to being delightfully entertaining, this book may help children learn tolerance with the message that people who appear to be different than you are can be very much like you. It may also help children who are struggling with identity. 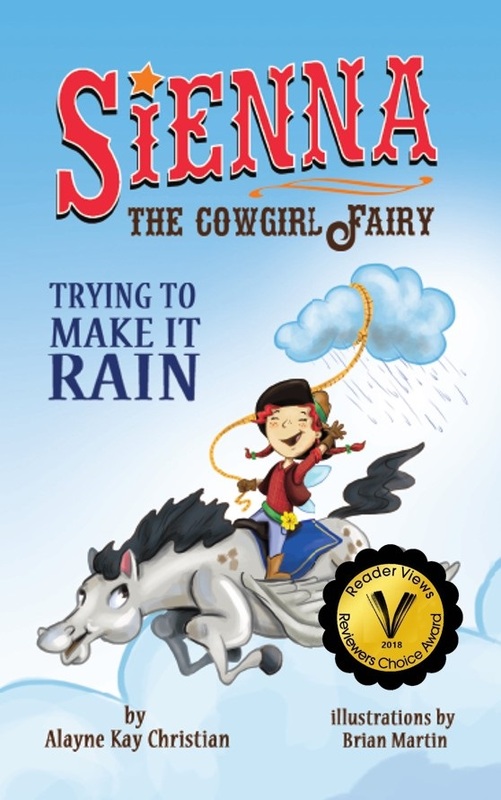 Sienna, the Cowgirl Fairy: Trying to Make it Rain is widely available in store and libraries. You can find links to some of them below. "Butterfly Kisses for Grandma and Grandpa," received the Mom’s Choice Awards gold medal and an IPPY Awards silver medal. Emily loves to visit Grandma and Grandpa. Like most grandchildren, she is showered with affection and enjoys the freedom to eat sweets, stay up late, and help Grandma in the garden. When Emily’s visit with her grandparents ends, she’s saddened by thoughts of missing them. To comfort her, Grandma gives Emily a book that teaches her to use her imagination, memory, and natural surroundings to help her feel close when they are apart. In a surprising role reversal, Emily comforts Grandma by sharing her own secrets for staying close. Following are three videos about "Butterfly Kisses for Grandma and Grandpa." The first one introduces the second video, which offers demonstrations for parents and teachers. Alayne and Elle show you how to engage younger children by using interactive sounds and motions as the book is being read. In the final video, Alayne talks about how "Butterfly Kisses for Grandma and Grandpa" can be used to help children cope when they are missing their long-distance loved ones, parents of divorce, military family members, or loved ones who have died. This next video offers demonstrations for parents and teachers. Alayne and Elle show you how to engage younger children by using interactive sounds and motions as the book is being read. In this final video, Alayne talks about how Butterfly Kisses for Grandma and Grandpa can be used to help children cope when they are missing long-distance loved ones, parents of divorce, military family members, or loved ones who have died. Alayne is available for school and library visits and speaking or readings at special events. Alayne offers professional picture book manuscript critiques. Aunt Rose is getting married, and guess who she’s asked to be her flower girl. Sienna’s sadder than a coyote without a howl. “I’d look mighty silly in a dress. I’d trip over my own feet in them fancy shoes. And I ain’t much good at manners neither.” Ma signs Sienna up for cowgirl charm school where Sienna discovers she’s even worse at being elegant than she thought she’d be. To make matters worse, Billy Bob and his band of bullies see Sienna in her charm school clothes and raise a ruckus. Maybe Sienna can teach them a thing or two about manners and poise. But can she learn enough at charm school to walk down the aisle without embarrassing herself and Aunt Rose? “Butterfly Kisses for Grandma and Grandpa” is available in bookstores, libraries, and Amazon.com. It is also available at Follett Library Resources.